Almonds and honey bees depend on each other, and pollination fees for almond orchards have stabilized after sharp increases a decade ago: Those are among conclusions of a report from the Giannini Foundation for Agricultural Economics at the University of California. 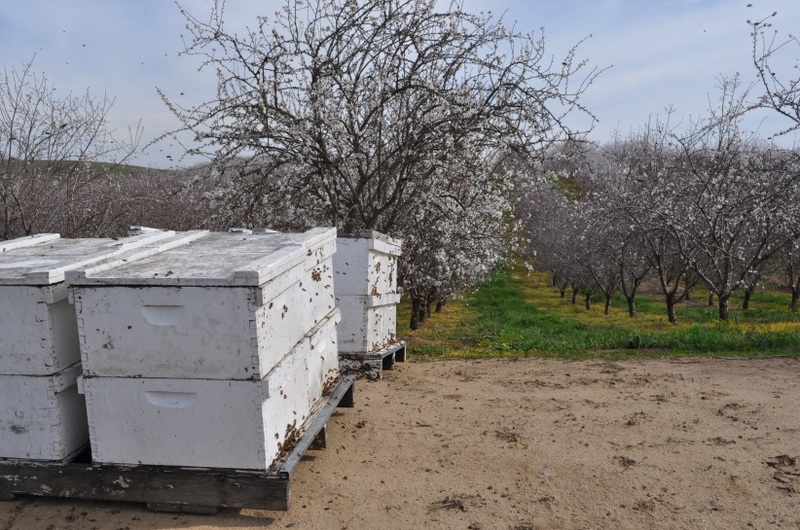 “Almonds depend on honey bees and the size and economic health of the beekeeping industry depends crucially on the economic health of the almond industry,” the UC report said. In 2016, pollination revenue from almonds totaled about $281 million, which the report said represented more than 90 percent of pollination revenue in California and more than 80 percent of nationwide pollination revenue. Bearing acreage of almonds has grown steadily since the mid-1990s, and with it grew demand for pollination services. The UC report said fees for pollination services rose steadily to match the increased almond acreage but spiked in 2006, jumping 80 percent. The UC report also tracked pollination fees for other crops, noting a range in fees from $18 for prunes, which are pollinated after the almond-blossom season, up to $185 for plums, which overlap with almonds. “The difference in fees between plums and prunes exemplifies the importance of pollination seasonality,” the study said, noting that the potential of honey revenue from a crop also appears to affect pollination fees. According to the report, beekeepers face many challenges in supplying the approximately 2 million colonies needed for almond pollination. With the close ties between beekeepers and almond farmers, changes in the almond market would also have significant repercussions for the bee business, the report said. The article was written by Hyunok Lee, a research economist at UC Davis; Antoine Champetier, a visiting lecturer at the campus; Daniel Sumner of the UC Agricultural Issues Center; and Jennifer Bond, a USDA economist.